A gaggle of excited Northwest Territories preschoolers has gathered around a table, pasting feathers and foam birds onto nests of tissue paper cutouts of their hands. Elzbieta Mastej, a master’s student with Wilfrid Laurier University’s Cold Regions Research Centre (CRRC), gently reminds the children not to fight over the birds and then asks them to sit to listen to her lesson about birdsong. It’s a scene that may at first seem a little odd; how does an environmental sciences student from Laurier find herself teaching and doing crafts with schoolchildren in Canada’s North? 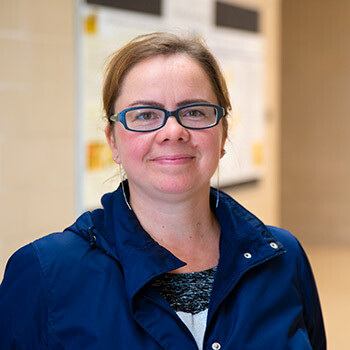 The answer lies in the forward thinking of Laurier research leaders who are forging lasting connections with the local community. Mastej headed to the remote Dehcho Region of the NWT this past June to work on permafrost research at Scotty Creek Research Station, which was founded more than 20 years ago by William Quinton, director of Laurier’s Cold Regions Research Centre and professor in the Department of Geography and Environmental Studies. Mastej and other members of Quinton’s team are working on ways to slow the critical loss of permafrost in the Dehcho – one of the fastest-warming areas in the world and one where the local people are contending with devastating changes to the land and water around them. Some members of Quinton’s team are working to understand how climate change will affect the hydrology and water pathways of the region. Mastej and two other team members, meanwhile, are testing a variety of designs of devices called thermosiphons, which help remove heat from the warming ground and thus slow permafrost thaw. The purpose is to develop the optimal thermosiphon designs for specific applications. Before she flew out to the research station, though, Mastej stayed in the nearby town of Fort Simpson to read, teach and make crafts with preschoolers at Bompas Elementary School. The former Polish teacher and Waterloo Region substitute teacher had designed a short educational program to encourage literacy within the context of Indigenous culture. For this she received financial support from Wilfrid Laurier University’s Student Horizon Fund. She read to the children and talked to them about how all five of our senses can be used to appreciate the beauty of the world around us. For the “taste” portion of the “five senses” lesson, she brought in sweet strawberries and sour lemons, which the children gobbled up while Mastej discussed the importance of healthy eating. Mastej, a mother of three, plans to complete her master’s degree this spring. But she also hopes to return to Fort Simpson to offer the educational program again, next time perhaps incorporating a few Dene Zhatıé (South Slavey) words from the local Indigenous language. All the supplies Mastej used in the class were covered by the Laurier Student Horizon Fund grant, which supports independent student projects and initiatives like hers. When Quinton learned Mastej had secured the grant, he encouraged her to offer her lesson plan in Fort Simpson. Quinton has worked in the NWT for decades and helped forge Laurier’s longstanding partnership with the Government of the Northwest Territories. He knows many of the local leaders, including the school district superintendent, so he put the two in touch. Mastej proposed her program to the Bompas principal and teachers, who loved the idea, and soon plans were being made. For Quinton, teaching preschoolers is all part of his larger vision of forging community connections and training the next generation of researchers and decision makers. He has long believed that any field work he and his team conduct in the NWT needs to be approved by and involve local communities. That’s why he offers field courses for local high school students, teaching them hands-on environmental sciences in the field, and how to present their findings in research reports. It is also why he supports the certification of Dehcho Guardians, teams of local residents who oversee new development and monitor the land. The long-term goal for the Scotty Creek Research Station, he said, is to transform it into a regional research park that would be Indigenous-led, where researchers and community members could work as partners to co-develop new knowledge about the land. The research park would also house a high-quality archive of data that would then inform local leadership when decisions are made about resource use, or about how to respond to new climate warming challenges. “They will have the benefit of data that dates back to 1990s. An Indigenous-led research park would be the first of its kind not only in Canada, but throughout the circumpolar region,” says Quinton. Mastej says working with Quinton and understanding his vision for the future of Scotty Creek has been an inspiration. “He has a unique approach. He sees the local community as being part of the future of the research and he wants to empower them to do their own research. That’s a vision you don’t see a lot,” she says.